This was issued 100 years before Michael Milken came along!!! 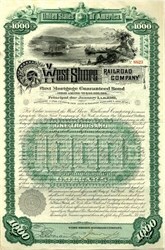 Beautifully engraved Bond Certificate from The West Shore Railroad Company which was issued in 1885. This cancelled certificate is a 475 year (Yes 475 YEARS) 4% $1,000 Bond which was structured to be due on January 1, 2361. The border of the item is an ornate green pattern with a beautifully engraved vignette showing a train next to a harbor with a steamship and sailing vessel. This item is signed on the verso by Chauncey Depew. 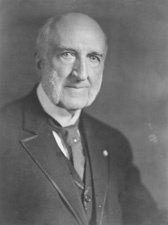 DEPEW, Chauncey Mitchell, a Senator from New York; born in Peekskill, N.Y., April 23, 1834; attended private schools; was graduated from the Peekskill Military Academy in 1852 and from Yale College in 1856; studied law; was admitted to the bar in 1858 and commenced practice at Peekskill, N.Y., in 1859; member, State assembly 1861-1862; secretary of State of New York 1863; appointed United States Minister to Japan by President Andrew Johnson, was confirmed by the Senate, but declined; unsuccessful candidate for election as lieutenant governor in 1872; colonel and judge advocate of the fifth division of the New York National Guard 1873-1881; unsuccessful Republican candidate for election to the United States Senate in 1881; appointed president of the New York Central Hudson River Railroad Co. 1885-1899, and later became chairman of the board of directors of that railroad system; unsuccessful candidate for the Republican presidential nomination in 1888; elected as a Republican to the United States Senate in 1899; reelected in 1905 and served from March 4, 1899, to March 3, 1911; unsuccessful candidate for reelection in 1910; chairman, Committee on Revision of the Laws of the United States (Fifty-seventh through Sixtieth Congresses), Committee on Pacific Islands and Puerto Rico (Sixty-first Congress); resumed his legal and corporate business pursuits in New York City, where he died on April 5, 1928; interment in Hillside Cemetery, Peekskill, N.Y.